THUNDER BAY – SPORTS – Over the March break, 28 ThunderBolt swimmers travelled to Winnipeg to compete in the 2019 Long Course Prairie Winter Invitational. The Bolts had an outstanding swim meet placing third overall for the men and second overall for the women. In this 4-day swim meet the ThunderBolts competed against swimmers from across the country from Vancouver to Oakville, Ontario. Best times, ThunderBolts club records and 54 medals were collected by the ThunderBolts at the swim meet. Leading the pack was Sam Chisholm and Isabel Harri with 5 gold medals each. “This weekend was great, the whole team performed well, we got a lot more medals than we have in the past. I was most happy about my 400-meter Individual Medley race as I beat my previous best time. I loved the whole weekend,” said a very happy Sam Chisholm. The 2019 Canadian Swimming Trials is the meet swimmers qualify for the 2019 FINA World Junior Championships. Also preparing hard for Canadian Swimming Trials is Lindsay Puhalski who also had an excellent PWI swim meet and a major breakthrough in her 400 meter Individual Medley winning gold and breaking the 5 minute mark for the first time. Puhalski won a total of 6 medals – 4 gold, a silver and a bronze. Other medal winners at PWI were Cameron Johnsen 3 gold, 1 silver, 1 bronze, Hannah Johnsen 1 gold , 3 silver, Kaitlyn Luu 1 gold, 2 silver, 2 bronze, Nik Black 2 silver, 2 bronze, Zoe Hunt 3 silver, 1 bronze, Luke Foulds 3 silver, 3 bronze and Jamie Puhalski 1 silver, 3 bronze. “I continue to be inspired by the swimmers and the club. With our very strong overall team effort and finish, it clearly demonstrates the Thunderbolts are ready to take it to the next level. Next year I believe we could win this swim meet,” added a confident Coach Panizza. 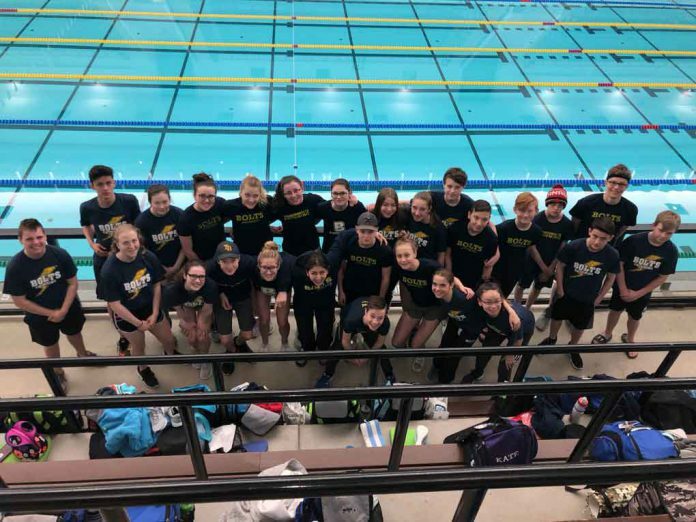 The ThunderBolts now have their sights set on Canadian Swimming Trials, and the Northwest Narwhal Long Course Swim Invitational and the Markham Invitational next month.